The enormous forces that build up in rifle barrels cause severe wear to lands and grooves. Here is a close-up of the throat wear in three different 6.5×55 barrels. These Norma test photos show wear after 10,000 shots with Norma Diamond Line “Bana”, after 3,700 shots with uncoated bullets, and after 7,000 shots with Diamond Line Fält. Compare the results for yourself. 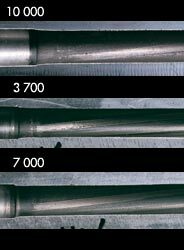 Norma claims “testing showed barrels retained accuracy more than twice as long when Norma moly bullets were used from the outset. This is because Norma Diamond Line is coated with molybdenum disulphide and a protective layer of wax. Friction is reduced which means that the bullet travels further along the barrel before peak pressure is reached. The result is lower wear and improved accuracy”. Read Norma’s full R&D report below. Lately there has been a lot of discussions about moly. After Kevin Thomas article in PS Jan we have received quite a few e-mails. Since we have been coating bullets for a few years we would like to share our experience. I guess this article will solve a few questions but probably raise a few too. During testing we have also observed that first shot out of a cleaned barrel is within the following group (@ 300 m). Moly is a superb friction reducer and it’s bearing capacity is beyond the yield point of known metals. When a molycoated bullet enters the throat and travels down the barrel it has less friction than a ordinary bullet. So it is not surprising to see a lower pressure. We have not done any huge tests with many calibers but these 3-5% has been there every time. If pressure is reduced velocity will also be lower with the same charge. The interesting thing is that velocity is not reduced as much as pressure. Thus, by increasing the charge you can usually get 1-2% higher velocity with moly bullets. Metal fouling is hard to measure accurately. We have observed through bore scopes and compared need of cleaning. It seems as coated bullets gives a certain degree of fouling but it more or less stays there. Our subjective estimation would be 30-40% less metal fouling and much slower buildup. This depends on cartridge, pressure, powder and bullet. I’m pretty sure we will see improvement in this area on the powder side quite soon. During our initial testing of moly we fired some 140 gn 6,5 bullets for accuracy. These bullets look very much like Sierra’s # 1740. We could see no improvement in accuracy at all. Testing continued with 6 PPC and Sierra 107 gn MK. About 60 5-shot groups were fired indoors at 100 m with three different loads. Every load showed smaller groups on the average (6-11%) and less standard deviation with moly. That was just a hint, no significant improvement (usually significance on 95% level is accepted as true). We went back and retested the 6,5 bullets with two different powders. Same result as first time – nothing happened. Then we coated our 130 gn VLD (Bill Davis design) bullet and fired a substantial number. Significant improvement on 95% level! Later we were going to load this 130 gn VLD bullet with MRP. Quality of the bullets was ok from the continuos testing during production but the results were quite bad for the loaded cartridge. Every single item in the cartridge was changed one at a time. When two different cases were tested things happened with one of them. That batch of cases was old and had thick necks. Suddenly accuracy was back. Also variation in pressure, barrel time and velocity was app. cut in half. Neck tension or extraction force as we call it, was the answer. We went back to the present cases and used a slightly faster powder and it worked fine. The 140 gn was tested once again but no responce in accuracy. So, be careful when using slow powders and moly coated bullets – it is very important the powder charge starts to burn the same way each time. One thing that differ from our testing and some others is that we always use new cases because that is the way loaded ammo is produced (jealous eh?). Sized cases would not be the same. Typically moly takes down the extraction force with 50%. One explanation of the increased accuracy could be that moly helps the bullet align in the bore. Thus, bullets with long bearing surfaces would not gain much from that help. Pistol bullets in 9 mm has been coated with no effect on accuracy. Probably more factors are involved that we don’t know of at this time. When it comes to increased barrellife statistics start to get a pain in b- – t. It is too much a work with too many variabels to do enough tests. However, we took a new Sauer 6,5 x 55 barrel and fired it 10.000 rounds with our standard load – 130 gn at 2700 fps. It was examined with a borescope every 1.000 round + measured with gauges. After 5.000 it looked very nice but after that it started to show pressure cracks. Wear in boredimensions was more or less normal. At 10.000 rounds it was set up at 300 m outdoors in a machinerest and 10 x 10 rounds were fired. It might have been a good batch for this barrel as average group size was 71 mm c to c or less than one MOA. That was good enough for us not to worry about barrel life. A shortcut to prove less barrelwear was to find out whether temperature of the barrel was lower with moly bullets. A heat sensitive digital camera was set up and we fired conventional bullets and moly coated bullets at the same muzzle velocity from a conventional target rifle. Of course the barrel was fired with uncoated bullets first and then cleaned. First thing was then to shoot some moly bullets to break in the barrel. It was also allowed to cool down to same temperature each time. Shooting pace was controlled etc. There was no difference in temperature at all. If it had been, it would more or less has proven less wear. David Tubb told me he had heard pistol shooters could feel the difference from moly bullets so there might be things out there! Some of our people who meet a lot of target shooters usually bring a borescope with a monitor to the major competitions. They look through hundreds of barrels each time. Their strong belief is that moly helps to prolong the accurate life of the barrels. A few tests were made to find out if the wax was necessary and if thickness had any influence. This was only tested with respect to pressure and velocity, no accuracy testing. Moly alone seem to give 60-65% of full effect. Wax only didn’t matter much. Moly together with wax made a better job. To have some excess wax didn’t hurt but too little made the reduction in pressure / velocity less. Only 6,5 x 55 was tested. Yesterday we compared our normal wax coating with a thinner and much nicer looking coat. There was an increase in velocity with 0,19% and in pressure with 1,23% when using less wax. No drop in accuracy was noticed. Our powder supplier – Bofors – ran a few tests with both moly and wax to find out if there were any negative effects on the powder. Moly destroyed the stability of the powder but only when concentration was a few hundred times higher than what normally occurs. Carnuba wax was neutral. We have done exactly the same tests as Kevin and usually we have seen a small decrease in BC. Probably due to our relatively thick wax coating. The first test we made showed an increase in BC of app. 3% but it was due to a mix of bullet batches. Also Randolph Constantine mentioned in PS Aug 98 that we found better BC using a doppler radar. I’m sorry but that was a misunderstanding. What we found was that BC was more or less the same from 200 m out to 600 m with conventional bullets. We didn’t know about moly at that time. Some good shooters report on higher impact with moly but I guess that must come from shifted barrel vibrations or different barrel time. I’ll be back on that later as we will test it in a 6,5-284 when we have the brass – May. A good friend won a 500 box of our 6,5 Diamond Line ammo. It did not shoot very well so he used it for training. Suddenly, after 300 rounds the ammo shot better than anything he has ever used. That was the worst case of ”getting used to moly” I know of. Usually it takes 5-30 rounds to get enough moly into a worn barrel. A new one is much easier, just shoot moly bullets during the break-in. Some people are afraid that tumbling their bullets will work harden the jackets. We ran some Berger bullets for 5 hours in our rotary tumbler and checked hardness – exactly the same or 137 Vickers / 1kg. A test was also done to see if time changed neck tension but we were unable to see any change at all. One important thing Kevin is pointing out in his article is that moly and wax should not be in the chamber. Too many shooters don’t clean their chambers. I’m not talking about you bench rest guys now. We are using OKS fine moly, 0,6-0,8 micron. Well, that’s about all we have done with moly. The commercial product has been very successful for us and we can’t see any reason not to continue. Photo and test article Copyright © 2004, Norma Precision AB, linked by permission. Topics: 6mm, 6BR, 6mm BR Norma, 22BR, 6PPC, 30BR, Norma Bullets, Norma Diamondline, Moly, Moly bullets, Moly-coating, Molybdenum Disulphide, Barrel Wear, Barrel life, Accuracy, Temperature, Velocity, Ballistics, Pressure, Norma R&D, Barrels, Reloading, Precision Reloads.